Aditya talks about how according to him, internships should be about professional growth and not stipend or the company brand. Read to know more. 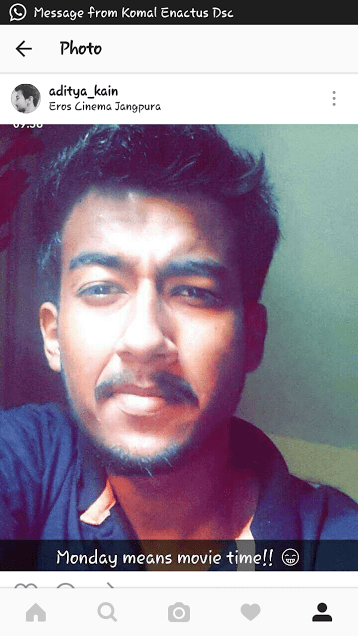 Aditya Kain (AK): My name is Aditya Kain and I’m pursuing my graduation from Dyal Singh College in BA (p). And I’m a delhite only. IF: Tell us something about your internships including stipend, duration, place and the kind of work carried out by you? AK: (1) At Misfits, I worked for 6 weeks. I worked mostly from home and went to their office only once. I worked as a volunteer also there. My job role was that of a social media marketing intern. It was a great experience. (2) Enactus DSC – I stands for Enactus Dyal Singh College. I worked there for 1 month and I was social media marketing intern here as well. My work was online and offline both. There was this one time where I was assigned a task of bringing some sponsors for them. I was pretty so close to getting it but in the end we came to know that they were already connected with Enactus of another college. (3) NearBuy – My job profile in NearBuy was marketing work like mouth to mouth publicity. (4) Poso – As for my role in Poso, I was required to call people and convince them to sign up with Poso and for each sign up I got INR 15. Except Poso, I got just certificates and letter of recommendations from everywhere, no stipend. AK: Selection process wasn’t tough for me because I’m a confident guy and my father has given me one mantra and that is if you are nervous don’t show that in front of that person. Be confident in front of the interview if you be a confident then chances of doing mistakes are almost nil. For me self-confidence, is this the only key which helped me and hopefully will be work for me always. AK: Obviously, according to me if you are doing any kind of work, YOU WILL SURELY LEARN SOMETHING FROM THERE. So for me no work is big or small, work is work which has to be done by positive attitude. And as you asked, the experience was totally amazing. Some of the tasks assigned to me went very well and some others didn’t. So the feelings are mixed. AK: One thing I learnt from all these internships was people skills – how to talk with people, how to behave with them, how to control your anger, how to do professional work and what happens in actual world. Also as a volunteer in the Misfits, I learned how to make connection big people; Enactus I learned how the real world does work really; NearBuy I learnt marketing and convincing skills. Poso frankly speaking now I can feel the pain of those people who call us about offers and all that stuff. So in the end I would say that experience was totally totally beautiful. As of now, I am looking for internships where I can do something besides what I already have. AK: I think after these internships, I understand the meaning of professionalism. After doing all these internship my graph has gone upward only. And I feel more confident now than before. AK: Umm..I will just say that keep the flow going if you are doing any internship, it doesn’t matter that it is paid or not. The main takeaway from any internship should be to learn something new and come out as a better person than what you were, professionally. In simple words, I would say that first start learning things and then ask for paid internships.